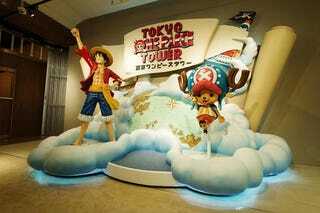 Dubbed "Tokyo One Piece Tower," this is Japan's first large-scale One Piece theme park. As Kotaku reported last year, this theme park (and it's explicitly being called a "theme park" or テーマパーク in Japanese) marks the 15th anniversary of the One Piece anime. Pretty cool, huh? Websites Biglobe, Fashion Snap, and newspaper Asahi got to check out the theme park before it opens tomorrow, as did a handful of Twitter users. There are cool One Piece sculptures and displays as well as carnival-type games. You can also go inside a Thousand Sunny recreation, watch the live action stage show that uses projection mapping, or dine on, you guessed it, One Piece food. For directions, ticket pricing, and more, check out the theme park's official site.